New York-born Ogletree was extremely active on a range of youth, LGBT, AIDS, and other causes in Chicago from the 1980s on. 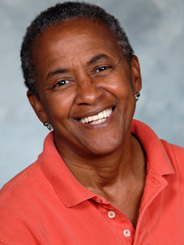 She was a key part of the organization Chicago Black Lesbians and Gays, and also on the board of Gay Games VII. Her own health issues did not sideline her critical contributions to an amazingly diverse range of groups even as she neared the end. She passed away in loving home hospice care on April 23, 2010.